Initially part number 10 (until 1904), the 1'' pulley was a single part in the days of MME. The feather key fixing technique meant that the pulley could be fixed to the axle or not depending upon the orientation of the key. With the advent of the boss in 1912, the pulley became much thicker, and so the part 22a was designed to fulfil the job of a 'loose' pulley. Generally, the two parts developed in parallel, as you can see by the matching pairs in the photograph to the right. Most variations applied to both types, after 1913. There are a small number of exceptions as you will see in the table at the bottom of the page. After the usual pile of different MME and early Meccano parts (pre-1912), there was not much change in the design of either part. The only difference is the groove width. This tends to start off quite wide (from 5/32'' to 3/16'' for the 'deep groove' version, 4-5mm). From the 20's right through to the early 70's, the thickness of both varieties dropped back to around 9/64'' (under 4mm). The late 70's yellow plastic varieties are thicker again, back over 4mm. 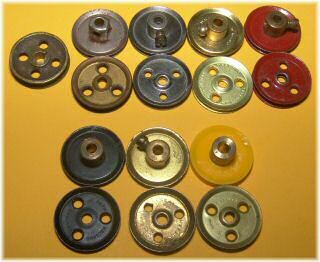 You can see the four 1'' pulleys with boss (left is early 20's wide, middle two are 30's and 50's, right-hand is yellow plastic and wide again). The 1'' pulleys without boss vary in a similar way. The left-hand part in this picture is the MME pulley (technically a part 22), then note the 'moulded' shape to the early two-part MME pulleys, becoming a wide V, then narrow by the nickel version of around 1915/16. The groove stays fairly consistent or narrows through to the post-war ones on the right. Late-70's plastic pulleys are wider again. Total number of messages on this page: 12. This is page 1 of 2. I have a number of these pulleys made from tinplate, unbranded - probably from Ezibuilt, Buz-builder or Lincoln. They are of appalling quality and when used on cranes, the cable splits the two halves and jams against the boss. This never happens with the Binns Rd articles - why not? Is it heavier guage metal or are they soldered? I have a plastic pulley (22bp) with a boss which is untapped and not drilled for tapping. Is this a special part or an anomaly. I will put a picture in my gallery. I have a single tapped pulley , one in a huge lot Im converting to collars, though perhaps not this one, which is marked MECCANO IMPORTE D'ANGLETERRE on both sides. I have come across some 1" pulleys with boss of the early standard boss type, that have one tapped hole and one untapped hole. Is this a known variation?